As a Canadian with a passion for military history, I have always felt very fortunate to be able to travel the world and walk on the battlefields of the First and Second World Wars, as well as the Korean War. It’s one thing to learn about history in school or through personal research, it’s quite another experience to be there in person! Having had the opportunity to visit many sites (some more than once) and to meet veterans and locals, I consider myself very fortunate. As a guide at some of these sites, I took great pleasure and pride in increasing my knowledge and sharing it with visitors from around the world. These are unique experiences that I will always cherish. With all these opportunities, it never crossed my mind that I might be missing something … until I took that first flight over the Vimy battlefield in 1999. I was instantly hooked! Flying over a battlefield makes you see it in a completely different light. It’s a chance to re-discover the battle and its history from a different perspective. Flying over Puys, Dieppe and Pourville in 2009 was fantastic! It sounds like a cliché but “WOW”! On the ground, you see the details, the monuments, the plaques, the cemeteries, etc. You get a small glimpse of what soldiers might have seen – though their experience remains difficult to imagine. In the air, you see the big picture, the challenges of the terrain, the limited routes inland, etc. In the air, you get a small glimpse of what airmen might have seen. If you’re lucky enough to also experience the battlefield from the sea (as I did in 2009 in front of Juno Beach on a DUKW) then you get the sailor’s point of view and that is the closest overall picture you’ll ever get. Having the opportunity to experience some battlefields from either one or several of these vantage points gave a whole new meaning to the readings, the movies and especially the first person accounts veterans and locals. Having a detailed historical background of the battlefield you are about to fly over definitely helps to maximize your appreciation of the experience. That being said, its memorable event even if you’re not so well versed. There are, however, a few things you should know before you decide to fly over a battlefield. If your plan is to simply ‘enjoy’ the ride, I recommend flying in a helicopter. There are usually 3 seats plus the pilot and you are in a climate controlled “bubble.” The down side for photos is that there is often reflection/glare in the window. This is why I prefer a small two-seat plane (just you and the pilot), especially when he is willing to remove the passenger door/window and fly relatively low. If you are afraid of heights like I am, this will be more of a challenge than the helicopter but the pictures you will bring back are worth the momentary fear! I flew over Vimy Ridge in a two-seater plane the summer of 1999. A wonderful experience and great photos to remember it by! 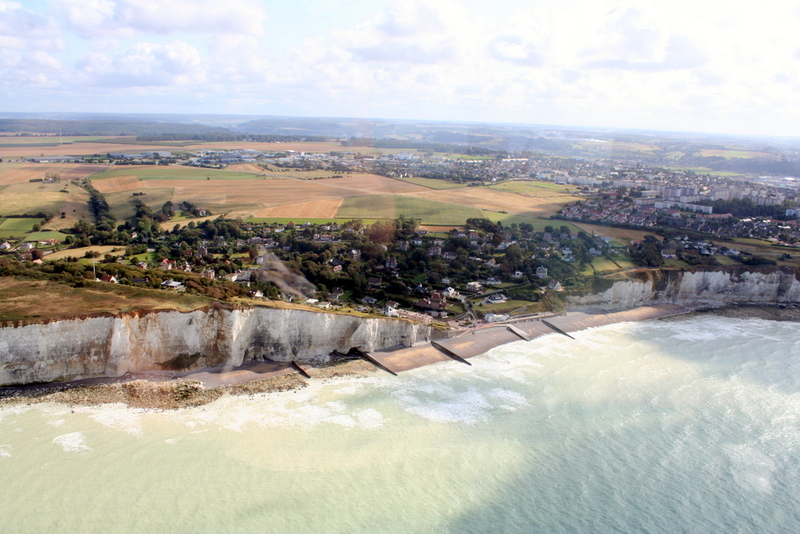 In 2009, I decided to fly over Dieppe. My only option was a helicopter. Luckily, there were a few clouds and the sun was relatively low so most of my pictures turned out great. As for the D-Day beaches, I had to make two attempts in a two-seater plane. The first one was in September 2011. It was not a great day for flying as there were winds of approximately 60 kilometres per hour. This made for an extremely bumpy ride … imagine a cross between a roller-coaster and very rough seas. Half way through the flight, it was so shaky that I was unable to get my SLR camera to focus. I had to revert to my ‘point & click’. I got a few good shots but this first flight was mostly a 90 minute-long roller-coaster ride. Since I was unhappy with the results, I made a second attempt in June 2012. Much better! The flight was early in the morning to avoid the afternoon rain and there was virtually no wind. The only down side was that it was quite cool and since the pilot had removed my door/window, my hands were numb by the end of the flight. The experience, though, was wonderful! Marie-Josée Lafond is the former Program Manager of the Juno Beach Centre (July 2006-January 2011) and currently the JBC’s webmaster.